Who doesn’t love ICE CREAM? That cold… sugary taste on your tongue… Aren’t you the biggest fan of ice cream EVER?! 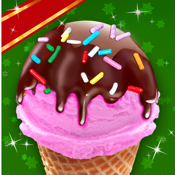 Well, devoted ice cream fan, you can now become even more devoted with this new app! What do you get when you mix SUGAR + ICE + MILK ? ICE CREAM! Make your favorite flavored ice cream! You can now create ice cream easily and quickly with the tap of your fingers! Tons of ice cream flavors to choose from… and plenty more toppings to add onto them! Try many different combinations and challenge yourself. See how many awesome ice creams you can make! Start now and create a huge collection to share with your friends and your family. Show us what you've got little dessert chef! - Design and create your own ice cream to make it gorgeous and extremely delectable! - Share with your friends and make them absolutely jealous of you! Just Download it for FREE now!